Orazio Zampini first appears in the Painesville, Ohio, area about 1897. 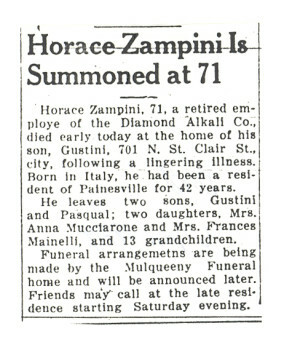 In America, Orazio Zampini was known as Horace Zampini. Orazio Zampini, son of Pasquale Zampini and Francesca Mainella, was born on April 25, 1867, at Frosolone, Italy. He married Maddelina Padula, daughter of Costanzo Padula and Rosaria DiTomaso, on January 15, 1902 at Painesville, Lake County, Ohio. Maddelina was the widow of Felice Palumbo when she married Orazio. Maddelina had a one-year old daughter at the time. Orazio died on Friday January 6, 1939 at his son’s home, 701 North St. Clair Street, at Painesville, Lake County, Ohio, at age, at age 71, of pneumonia. His body was interred at Saint Mary Catholic Cemetery at Painesville Township, Lake County, Ohio. Orazio Zampini, age 16, first immigrated to the United States on March 20, 1884. Orazio re-enters the United States on August 18, 1896. He was travelling to New York City. Orazio Zambino became a citizen of the United States on April 7, 1902. Orazio resided at Lake County, Ohio, when he was Naturalized. He was a retired employee of the Diamond Alkali Company. 1. Frances Zampini was born on February 3, 1903, at Painesville Township, Lake County, Ohio. She married Costanzo Mainella, son of Alessandro Mainella, on April 29, 1922, at St. Mary Catholic Church at Painesville, Lake County, Ohio. Frances died on June 14, 1965 at her home, 211 Sanford Street, at Painesville, Lake County, Ohio, at age 62. Her body was interred at Riverside Cemetery at Painesville, Lake County, Ohio. 2. Pasquale Zampini and Maddelina Padula, was born on July 17, 1904, at Ohio. Pasquale died on February 28, 1913, at Painesville, Lake County, Ohio, at age 8. His body was interred at St. Mary Cemetery at Painesville Township, Lake County, Ohio. 3. Augustino Zampini was born on December 1, 1905, at Painesville, Lake County, Ohio. He married Teresa Mary Zampini, daughter of Egidio Zampini and Maria Giuseppa DiIorio, on April 10, 1928, at St. Mary Catholic Church at Painesville, Lake County, Ohio. Augustino died on April 12, 1975 at Lake County Memorial Hospital at Painesville, Lake County, Ohio, at age 69. His body was interred at Riverside Cemetery at Painesville, Lake County, Ohio. 4. Dominic Zampini was born on August 6, 1908, at Painesville, Lake County, Ohio. Dominic died on April 15, 1909, at Henry Street, Painesville, Lake County, Ohio, from pneumonia. His body was interred at Saint Mary Cemetery at Painesville Township, Lake County, Ohio. 5. Infant son of Orazio Zampini and Maddelina Padula was born on January 20, 1910, at Painesville, Lake County, Ohio. He died on April 25, 1910, at Painesville, Lake County, Ohio, from pneumonia. Her body was interred at Saint Mary Cemetery at Painesville Township, Lake County, Ohio. 6. 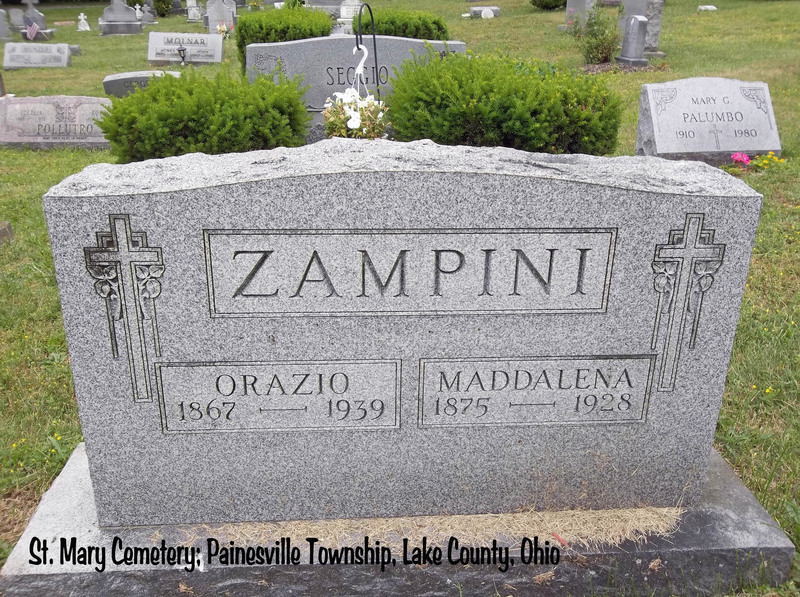 Infant daughter of Orazio Zampini was born on July 21, 1911, at Painesville, Lake County, Ohio. Infant Daughter died on July 25, 1911, at Painesville, Lake County, Ohio, of an intestinal obstruction. Her body was interred at Saint Mary Cemetery at Painesville Township, Lake County, Ohio. 7. Pasquale Zampini was born on April 2, 1913, at Painesville, Lake County, Ohio. Pasquale died on September 1, 1979 at Huron Road Hospital at East Cleveland, Cuyahoga County, Ohio, at age 66. His body was interred at Riverside Cemetery at Painesville, Lake County, Ohio.